At this sale price this collar is only available in the sizes and colors listed. There is only 1 collar available in some colors and sizes. 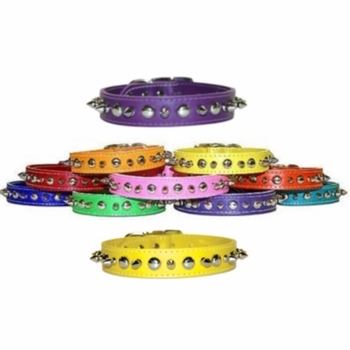 Make that small dog feel like a tough dog with one of our spike and stud leather dog collars. This leather collar is 1/2 inch wide and available in sizes 10, 12 and 14. For correct collar size, measure your dogs neck and see the size chart below. Size 10 will fit a dog with a 6 to 7.5 inch neck. Size 12 will fit a dog with a 8 to 9.5 inch neck. Size 14 will fit a dog with a 10 to 11.5 inch neck.